Zeeland’s Roem is part of the Roem Group, Europe’s largest seafood processor with premises in the Netherlands and Germany. Mussels, oysters and prawns play the leading roles. With Europe’s cleanest seawater all around us the Zeeland’s Roem factory takes the pick of the mussel crop, delivered fresh from the Oosterschelde to our quayside landing facility for processing from July to the following April. Elsewhere in Yerseke Zeeland’s Roem has a second factory used for the production of preserved foods and chilled fresh products including mussels and a wide range of mussel specialities, a perfect base for a main meal or a tasty snack. It’s the sourcing that sets our Zeeland’s Roem fresh mussels apart. Mussels bearing the Zeeland’s Roem label come exclusively from the pure, nutrient-rich waters of the Oosterschelde and the Waddenzee. Roem van Yerseke B.V. guarantee that the mussels we process meet the very highest quality standards. Zeeland’s Roem fresh mussels are available in a range of package types and sizes. Just contact us for further information. Fresh-cooked mussel meat is a quality product presenting infinite culinary possibilities. Available both deep-frozen and chilled fresh, our fresh mussels are cooked under expert supervision. Once the mussel meat is separated from the shell it is inspected and selected both mechanically and by eye, then packed in a protected atmosphere in trays of different sizes or deep-frozen in plastic bags or in bulk. Just contact us for further information. The classic mussel! These products with their long shelf life are indispensable for any true mussel lover. The glass jars are filled to the top with the finest quality mussels. Whether it’s the traditional mussels in vinegar or one of our flavoured varieties, the end result is unbeatable. This ready-to-use product is available in various sizes of jars and in plastic trays. Just contact us for further information. Enjoy mussels from the shell, quicker and easier than ever before. That’s “Mussels à la Minute”. Five to six minutes in the microwave and the job’s done! Our technically advanced production process ensures the fresh mussels retain their delicious salty taste and tender texture. This is a healthy and tasty ready-to-use meal with no added preservatives, and it can be kept for up to 21 days if refrigerated. Suitable as a main course for one or a first course for two. Relished by the young and old, whether it’s a lively party or a quiet supper for one. This product is available in various flavours. Just contact us for further information. Protect your hand with a thick towel because the shell has sharp edges. Lay the oyster with the rounded side down so that the liquid will remain in the shell. Hold the oyster firmly and push the knife in at the hinge. This sometimes needs quite a bit of force. Make a twisting motion from your wrist until the upper shell comes free. Slide the blade along close to the upper shell to cut the muscle. Be careful not to touch the oyster itself and damage it. Remove the upper shell. Cut the muscle loose from the lower half too and turn the oyster over. And let the feast begin! Our instruction video shows you how in less than a minute. The oyster is a sought-after culinary delicacy, famed for its wonderful shell, its beautiful soft flesh and its creamy, salty taste. A gift from the sea, especially for real connoisseurs. So you really shouldn’t miss out on getting to know these oysters from Zeeland’s Roem! The variety of types in the range means that there’s an oyster for every occasion. All these jewels are quality-tested by experienced staff and placed carefully in the packaging one by one. 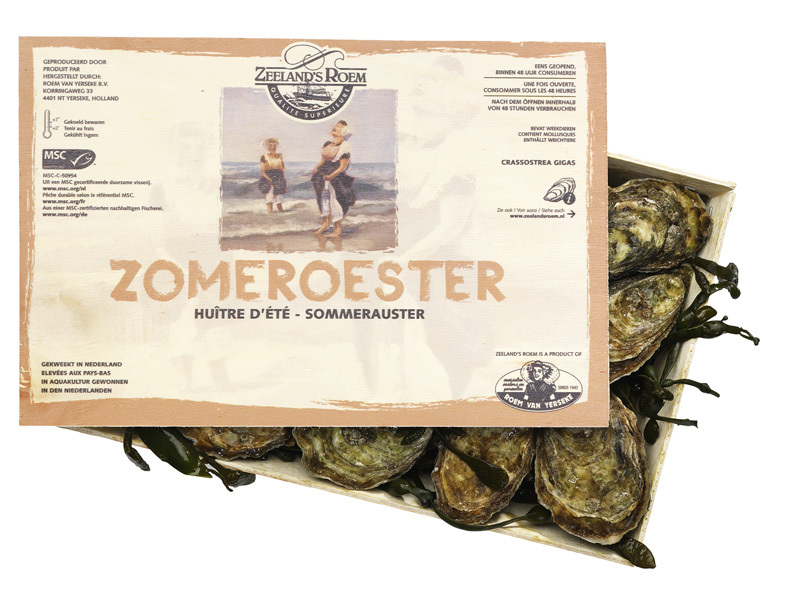 Origin: culturing the flat oyster is done on oyster beds in the Oosterschelde and in the Grevelingen lake. When the water temperature reaches about 16°C, the oysters start spawning. Oyster sperm and eggs are released that float around freely in the water. Empty mussel shells are spread around the oyster plots that the oyster larvae settle on and attach themselves to before growing further. The small oysters are then collected and put out on the most nutrient-rich beds where they are looked after carefully until they are large enough for consumption. Shape: the most striking feature is the uniquely rounded and flat shell on which attractive growth rings are clearly visible. Despite the flat shape of the shell, it is nicely filled with creamy, delicate oyster meat. Taste: like the grapes for wine, the taste of an oyster depends on the bed it is grown in. The specific feature of this salty jewel in Zeeland’s crown is the velvety and slightly sweet taste. Choose the flat Zeeland oyster if you have something special to celebrate, if your best friends are coming to visit or if you simply fancy an ultimate moment of indulgence. This oyster does not need anything more at all, but a good dry white wine will make the experience complete. The queen among oysters is unique and has a chic appearance. This round, flat oyster is cultivated with a great deal of care and love. The overall culturing process can take about five years. This oyster is not available during the spawning season from April to September. Flat oysters are available in various sizes, indicated by zeroes. The oysters range from 2/0 to 6/0 and even 6/0 luxury; the more zeroes there are, the bigger the oyster! Read the story behind this oyster. So deliciously salty… Summer Oysters from Zeeland’s Roem! Summer in Zeeland! That means more than just the sea and the beaches: it means oysters! Summer, the best time of the year to enjoy these little gems. The waves breaking, the wind through your hair, paddling barefoot in the water… Take the Zeeland atmosphere and that feeling of happiness back home with you! Only the oysters that reach their peak during this period deserve to be called Summer Oysters. Let your holiday feeling linger, spoil your guests, impress your loved one. The Summer Oyster is an elongated, irregularly shaped oyster with a light, salty taste and a creamy but firm structure that brings that taste to the fore. The Summer Oyster does not reproduce in summer. That means the shell remains nicely filled with tasty oyster meat. Did you know that oysters aren’t only a feast for the taste buds but that they’re also very good for you? Thanks to the high levels of magnesium and zinc, you have a genuine vitamin bomb in your hands. With almost no fat to boot. Pour yourself a nice wine or a refreshing glass of beer and imagine for a while you’re on the Zeeland coast! Sun, sea, Summer Oyster! The name says it all. This oyster is the perfect choice for the summer. And that in turn is the ideal time to sit outside and enjoy this fresh, salty delight. The attractive shell is nicely filled with a creamy oyster. The Summer Oyster is supplied in one size. An appealing size for every occasion. Read the story behind this oyster. 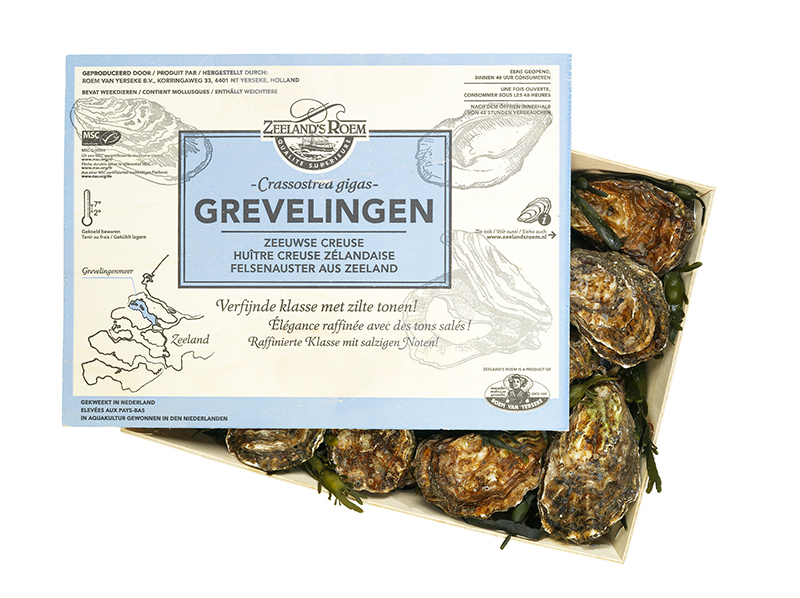 Origin: the Grevelingen creuse from Zeeland is a bottom-cultured oyster that grows in the Grevelingen lake, which is the largest saltwater lake in Western Europe. During the period when oysters reproduce, the oyster sperm and eggs float around freely in the water. Empty mussel shells are spread around the oyster plots that the oyster larvae settle on. The larvae attach themselves to these shells and then start growing there. After around three years of intensive cultivation, they grow into a superb, well-filled oyster. Shape: Grevelingen creuses are long and irregular in shape with a relatively deep shell. They have plenty of freedom to grow on the lake bed so no two oysters are identical in shape. Taste: the taste of the oyster is determined by the soil of the bed that these beautiful shellfish grow on. The waters of Grevelingen are a relatively small area with a stable climate. The oysters there are imbued with a specific, slightly sweet taste sensation in which the salinity of the Grevelingen lake predominates. The Grevelingen creuse has a refined taste that is ideal for serving straight or with pepper and a drop of lemon juice. Or try varying it by adding your choice of vinaigrette or a little crème fraîche with very finely chopped fresh chives. This oyster is available for much of the year and you’ll always want more! The Grevelingen oyster from Zeeland is very accessible and one of the highlights of the Crassostrea gigas family. As you might guess from the name, it grows in the Grevelingen lake. This oyster, which is cultivated on the lake bed, has become renowned both at home and abroad for its quality and taste. The Grevelingen oyster is available in three sizes – categories I, II and III (where III is the smallest). Read the story behind this oyster. 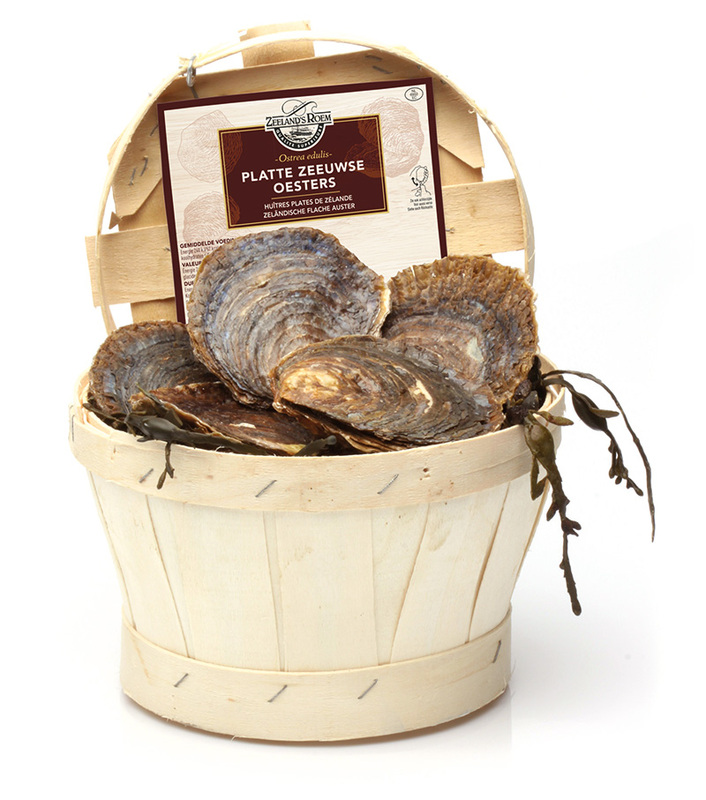 Origin: the creuse is a bottom-cultured oyster. During the period when oysters spawn, the oyster sperm and eggs float around freely in the water. Empty mussel shells are spread around the oyster plots that the oyster larvae settle on. The larvae attach themselves to the mussel shells and then start growing there. They are mature and ready for consumption after about three years. The creuse is available all year round and comes from a variety of growing areas. Shape: the irregular, elongated shape is typical of this oyster. Because it grows on the bed, the shell does not have a regular shape. This rough exterior means that no two shells are identical. Taste: the saline notes and the pleasant aftertaste predominate in the creuse. It is a sturdy and robust oyster with a lot of bite. The creuse can be served perfectly well just plain, with a drop of lemon juice and a touch of pepper, but it is also excellent for gratin dishes. It is an oyster that can be used everywhere. It is also an attractive option in terms of the price-to-quality ratio. Tip: fill the empty oyster shell with a dash of gin for an exceptional taste experience. This type of oyster is available almost all year round. A no-nonsense oyster for every occasion. It is a rugged, elongated and irregularly shaped bottom-cultured oyster of the Crassostrea gigas family. They grow to become a commercially viable oyster in two to three years. This type is often used in gratins. The creuse is available in three sizes – categories I, II and III (where III is the smallest). Read the story behind this oyster. 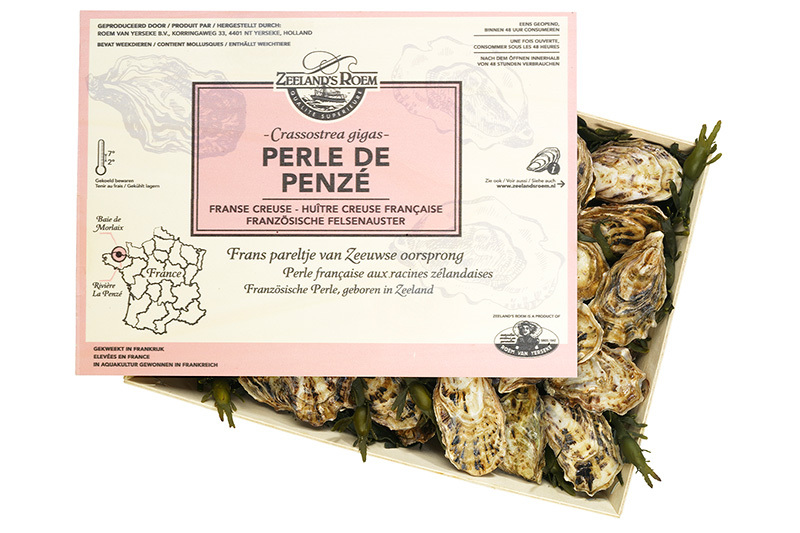 Origin: the Finesse de Zélande is a small but well-filled oyster. It is exceptional because it first sees the light of day in Roem van Yerseke’s own breeding farm. They are looked after and guided from the very first moment. This labour-intensive process makes it possible to monitor the quality constantly. When they are big enough, they grow further in triangular baskets made of plastic mesh that are hung above the sea bed in the Oosterschelde. This protects the Finesse against storms and natural enemies. Shape: the process of cultivation in baskets keeps the oysters moving against each other because of the tides and waves so that the edges are broken off more easily as they grow. They remain relatively small and acquire the shape that makes the Finesse de Zélande so unique: a short, deep shell in which plenty of space is created for the refined and elegant oyster meat. Taste: the pure and nutrient-rich water of the Oosterschelde gives this soft, creamy oyster its salty taste. It can deservedly be called a savoury treat from the sea! Enjoy this oyster with a chilled glass of bubbly or dry white wine. 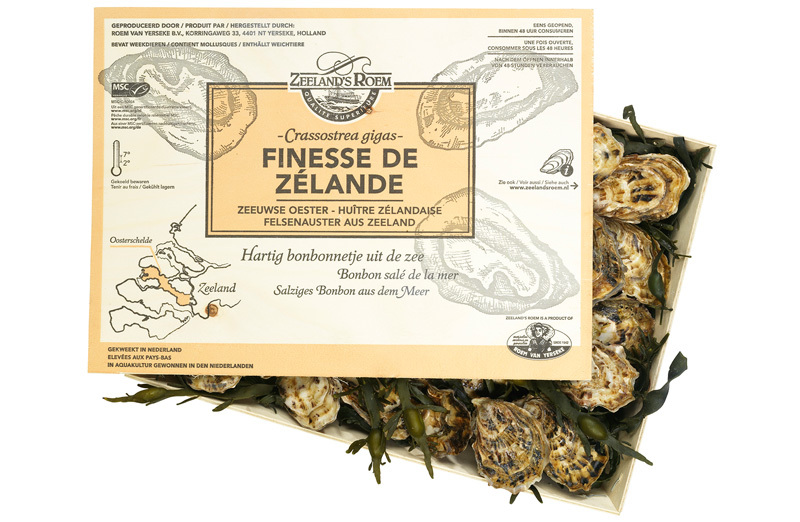 The Finesse de Zélande is perfect as a first introduction to oysters. Its modest dimensions also make it ideal for serving as an amuse-bouche or as finger food. The name of this quintessential Zeeland oyster says it all: a refined shellfish from Zeeland’s waters. In the Oosterschelde, this off-bottom oyster grows to become a tasty treat from the sea. The growth of this oyster is guided from the very beginning, which is how it gets its superb shape. This small but excellent beauty is available in one size. Read the story behind this oyster. 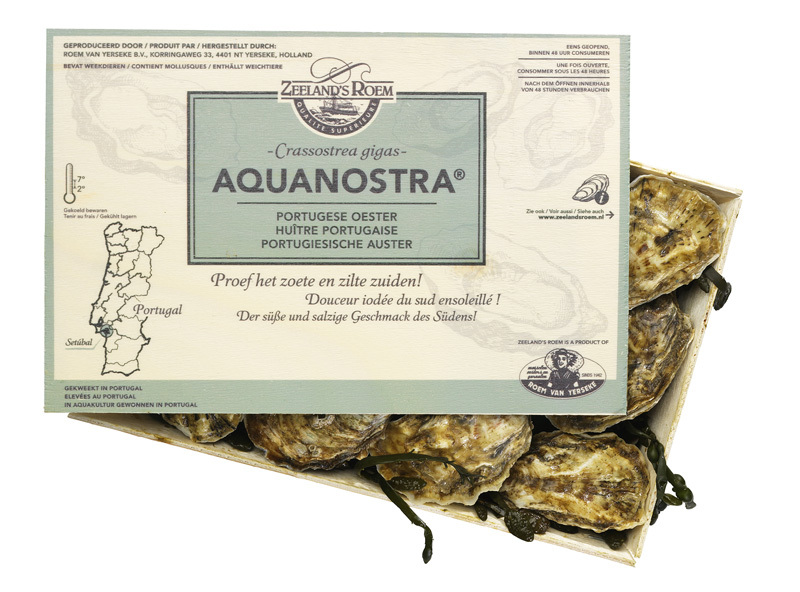 Origin: The Aquanostra, which translates as ‘our waters’, develops its specific flavour and characteristics in the waters of both Zeeland and Portugal. The oysters are spawned in Zeeland and cultured in Roem van Yerseke’s own breeding farm. After about two months, the spats grow to about 1 cm in the lovely waters of the Oosterschelde estuary. Then they are taken to Setúbal in southern Portugal. Here they continue to grow in elongated sacks made of synthetic gauze that are suspended above the bed. They are cared for lovingly and expertly by our own people. The wonderfully sunny conditions mean they grow relatively quickly into oysters ready for consumption. It’s a labour-intensive process, and you can taste that! Shape: The process of cultivation in sacks keeps the oysters moving against each other because of the tides and waves, which gives this unique oyster a short, broad, deep shell. The Aquanostra feels in its element in this little home. Taste: The oyster has the River Sado — one of the biggest rivers in Portugal — to thank for its specific taste. The river flows into the Setúbal delta, where the Aquanostra grows. The nutrient-rich water of the Atlantic Ocean flows into the delta along the other side, giving the oyster an ideal cocktail of nutrients. The creamy oyster in its attractive, well-filled shell will surprise you with its mild, sweet flavour with a hint of salt. Experience this mix of the robust spirit of Zeeland married to the charming southern European character, and enjoy this delicacy au naturel or add a pinch of pepper. Serve with a dry white wine or bubbly and savour the unique fusion of two countries! Sunny southern Portugal is responsible for the fine character of the wonderful Aquanostra, an oyster with Zeeland roots. This off-bottom oyster is reared in the Setúbal delta. The shell is less irregular than that of the average creuse, which gives its shape a very different outline. The Aquanostra is supplied in one size. An appealing size for every oyster lover. Read the story behind this oyster. Origin: these oysters are spawned and cultured in Roem van Yerseke’s own breeding farm. After about two months, the spats continue to grow in the beautiful waters of the Oosterschelde. When they reach one centimetre in size, the oysters are moved to the River Penzé in the Baie de Morlaix in Brittany (France). In this beautiful and rugged area, where a biting wind is often driven in from the Atlantic Ocean, they grow into strong oysters. The processes at the family-managed farms are labour intensive. And you can taste that personal touch in these oysters that are so full of character! Shape: the small oysters grow in bags made of plastic mesh that are laid on tables in the river. The oysters are moved about inside them by the tide and the waves, giving them the typical shape of the Perle de Penzé. A genuine French peal with an irregular shell shape that can only be created by the oceans. Taste: the oysters get their food from the crystal-clear water of the Penzé. The salt of the Atlantic adds its own impressions to the taste of the Perle de Penzé. This salty, fleshy oyster is a delight for the taste buds. The robustness of Zeeland is combined perfectly with the Breton character. The superb result does not need any embellishment. A good glass of white wine or a rich glass of beer will make your enjoyment complete. Spend a little time with this unique fusion of two countries! This pearl, which is grown in the river Penzé in Brittany, was spawned in Zeeland. This Crassostrea gigas is cultured in France to produce a robust, irregular oyster. This is done in nets that are laid on tables where the oysters grow under expert supervision. They come in three sizes that are classed as category II, III and IV (with the last of these being the smallest). Read the story behind this oyster. Origin: these off-bottom oysters are grown above the bed in a protected environment in the Oosterschelde. The entire lifecycle takes place at a single location, from seed collection through to consumption-ready oyster. The oyster larvae that swim in the water settle on what are known as collectors. These are removed and placed in sturdy nets on ‘tables’ to grow further. They are moved regularly to nets with larger meshes. Once the oysters are large enough and the shell is sufficiently filled, they are harvested. Shape: the Tabl’eau de Zélande has a relatively smooth shell and a deep bowl. This is a consequence of the culturing method. Under the influence of the incoming and outgoing tides, the oysters are constantly moving. The shells lose their sharp edges as a result and acquire a nice, deep bowl. Taste: the currents and tidal flows mean that oysters on the tables receive different algae than ones on the seabed. This gives them a characteristic taste. A strong bite goes hand in hand with a salty experience and a somewhat sweetish aftertaste. This oyster is only harvested when the quality is at its best, so it is not available all year round. 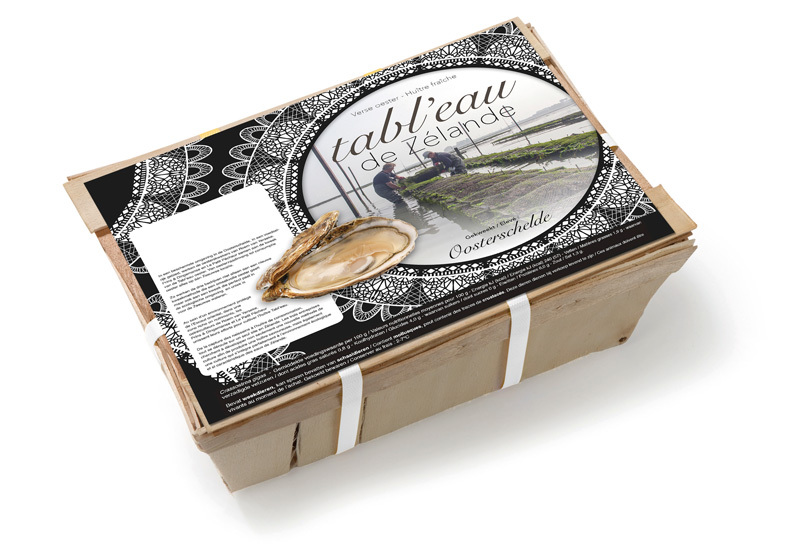 The Tabl’eau is a handy oyster that is easy to open. Serve with drinks or as an amuse-bouche with just a drop of fresh lemon juice. This so-called ‘table oyster’ is cultured off-bottom in Zeeland. The oysters are spawned in the nutrient-rich waters of the Oosterschelde and this is also where they are grown. They are cared for intensively while they grow, ensuring an attractive-looking shell that can be shucked easily. This Zeeland variant of Crassostrea gigas is available in a single size. Read the story behind this oyster. Roem van Yerseke provides for many different types of prawns, from the Dutch coast to the Far East, from the warm Caribbean to the chilly Northern waters. Roem van Yerseke offers prawns using their Zeeland’s Roem brand. Outside the Benelux countries the prawns mostly carry the Lacor brand. In the world of prawns it’s the Dutch shrimp that bears the crown. Also known as Grey Shrimp or North Sea Shrimp, these are relatively small pink coloured crustaceans. Our Zeeland’s Roem Grey Shrimps are cooked on board the fishing vessel immediately after the catch. The quickest route takes them to our own peeling facility where experienced hands peel them in a tightly controlled hygienic environment. They are then packed or deep frozen in the high-risk zone in our IFS certified factory. Just contact us for further information. Roem van Yerseke is highly selective when it comes to the purchase of tropical prawns. Quality is paramount at all times, and only the very best prawns are purchased for packaging at our factory in Yerseke. Our extensive range includes pink prawns, jumbo prawns, tiger prawns and shrimps. Our purchase specifications greatly exceed the European Gap standard, guaranteeing quality, and environmental and social sustainability. Many of the products carry ASC certification. Our tropical prawns are supplied deep frozen or packaged in a protective atmosphere. Just contact us for further information. Zeeland’s Roem supplies a unique range of convenience products, including the very special “ à la minute” range. Microwaveable meals that only take a few minutes to prepare but still have all the taste and texture of the fresh product. Have your fresh mussels or lobster on the diner table in a few minutes ! Next to this fresh sensation Zeeland’s Roem supplies atmospherically packed products such as prawns and mussel meat. Perfect ingredients ready to use. Eating lobster is a culinary experience. Lobster is mostly eaten in a restaurant because most people are not equipped to prepare this delicacy at home. Zeeland’s Roem changes that with the introduction of the fresh prepared lobster in the “à la minute” range. Building on the success of our Mussels à la Minute we decided to expand the concept with this luxury product. The result is a beautiful fresh lobster that can be served cold or hot. A real fresh taste sensation, ready to serve in minutes. A half lobster makes a great first course, or serve the whole lobster as a main course. Just contact us for further information. Quality and convenience in one! Based on tropical prawns this flavoursome dish is ideal as a starter, a component in a main meal, a tapa or as a snack with drinks. You don’t need to fire up the barbeque to enjoy Zeeland’s Roem scampi brochettes, they are ready after just a few minutes in the microwave. The sleek skin packaging contains four brochettes, and this luxurious treat is available in two flavors. The mouthfeel of these prawns is perfection. Just contact us for further information. Zeeland’s Roem can supply everything you need for a delicious and easily prepared seafood meal. The classic meal of mussels calls for a suitable pan, and Zeeland’s Roem has the very thing for you. Carefully selected mussel herbs make preparation even easier, and our other products like prawns, crayfish meat or breaded mussels are transformed in no time into a superb culinary display. Try our Chuka Wakame (Japanese seaweed salad) for a fine finishing touch. Chuka Wakame is a most unusual fresh green salad, a Japanese recipe using blanched seaweed with a marinade of sesame oil, sesame seeds, soy sauce and a dash of red pepper. Originally an accompaniment for sushi and sashimi, it also goes wonderfully with raw oysters or prawns. Sweet, salty and with a hint of spice. Just contact us for further information. Producing a wide range of shellfish as we do, it seems only logical to combine these into a delicious mix. We add cockles and squid to our mix of mussels and prawns to present a complete seafood cocktail. We source our ingredients with care, selecting for flavour as well as colour. An exciting product to serve hot or cold. Just contact us for further information. Crayfish are increasingly popular, which is no surprise to us as they have so many uses, from snacks to main meals. Crayfish are healthy and tasty. Crayfish differ in taste and texture from prawns, but you can use them in similar ways. The striking colouration of the crayfish meat raises this ingredient to a whole new level. These crustaceans are supplied ready for use. Ideal in cold dishes but also wonderful in soups or with pasta. Just contact us for further information. Breaded mussels can be used for many different occasions . These deep-frozen mussels are herby and crispy. The cooked mussels are battered, pre-baked and immediately individually frozen. The result is a superb crispy mussel, with the real mussel taste. This is a product that will always merit a place in the freezer. A delicious party treat, a stunning starter and of course it makes a great main course with salad and chips. Just contact us for further information. Zeeland’s Roem mussel pans are specially designed to cook mussels. It is important that mussels are heated up rapidly to keep the meat tender, that is why the bottom of our mussel pan is thin. Because the shells open during cooking, they need extra space. That accounts for the special shape of the pan lid, which also makes an ideal receptacle for the empty shells. Zeeland’s Roem Mussel Herbs are the ideal way to add extra flavour! Just contact us for further information. The revitalisation of the seafood sector is very much a live issue today, and is urgently required. We therefore aim to keep our business, Roem van Yerseke, at the front of the field when it comes to novel cultivation methods, quality processes and optimal control of food safety. Our High Risk Department has recently undergone a thorough renovation and modernisation, creating additional capacity and precise climate control and allowing us to guarantee optimal processing and packaging of our “ready to eat” products. Products in the “à la minute” range from Zeeland’s Roem are innovatory and unique. Seafood including mussels, clams and lobsters are prepared in Europe’s biggest microwave oven. A special procedure ensures that these products retain all the taste, texture, quality and bite of the fresh product. Contact us for further information about our microwave meals. Roem van Yerseke have been researching the breeding and cultivation of seafood on and offshore for many years now, resulting in the construction of our own unique hatchery for crustaceans and shellfish. Our investigations and laboratory experiments have provided us with a wealth of knowledge about the multi-facetted task of breeding shellfish and crustaceans, eventually resulting in a breakthrough in the cultivation of a number of species, notably our Champagne Oyster. The quality department of the Roem Group is responsible for Quality and Food Safety. Roem van Yerseke is awarded with various certificates, such as IFS Food, MSC, ASC and BIO. Click on the logos to download our certificates. 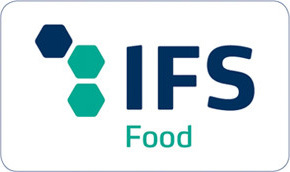 Roem van Yerseke is IFS certified (International Featured Standard). is means that our company meets the required standards concerning quality and safety for processing and pack- ing food. is certificate is recognized internationally by the Global Food Safety Initiative. MSC (Marine Stewardship Council) is an independent, international non-profit organization that aims to reduce overfishing throughout the world. e MSC Fisheries Standard is used to assess the sustainability of wild-capture fisheries. ASC (Aquaculture Stewardship Council) is an independent not for profit organisation with global influence. e ASC’s mission is to transform aquaculture towards environmental sustain- ability and social responsibility using efficient market mechanisms that create value across the chain. ASC certified shellfish is the best environmental and social choice when buying seafood. 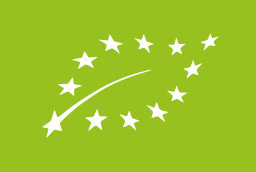 The European Union has taken action against the unofficial growth in certification for organic products. e Euro-Leaf bio-certificate is only awarded to companies that meet the strict requirements. Zeeland’s Roem is a product of Roem van Yerseke B.V.